So, I finally got stamping over the last little while. 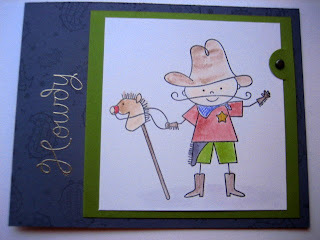 This card was inspired by a picture someone had taken of the picture boards from the recent Stampin'Up! cruise. I had done some square purses using my square punch. This is using the round tab punch. This is going to be for a birthday card for my friend Candace, who turns 31 (I think). All Stampin'Up supplies unless noted. Paper: Barely banana (or so saffron), old olive, basic black and non SU shimmery white. Accessories-silver cord, black and antique brads, micro hole punch, round tab punch, dimensionals. 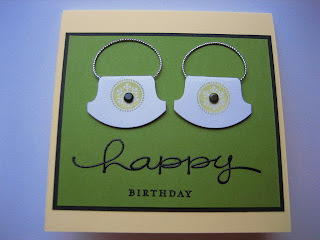 Next card is one I completed for my monthly Swap Club. The challenge was to use a media apart from inks. I chose to watercolour. I borrowed this set from my friendPeggy about a month ago and am still sitting on it. I figured I should use it at least, to justify the loan. Paper: Vintage violet, old olive, non SU (shhh!) shimmery white. Inks: Versamark, Platinum EP, olive, violet, blush blossom, close to cocoa, choc chip, cranberry, black. Accessories: Aquapaint er, metallix pens (gold, blue and red for the star, the kerchief and muzzle on horse), antique brad, slit punch. The next card is one I made for my sister, who is travelling for the next six weeks. I love the doggy Patch. Patch is from A Muse Art Stamps. He is stamped with Versamark and embossed with black EP. I stamped patch on the non-SU shimmery paper (yes, I love it- it has silver shimmer and I ordered lots off it off a papershare I found.) I also used my Marvy mega square scallop punch to make the black frame for Patch. 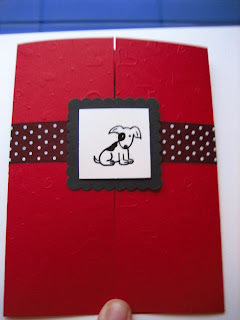 Organdy polka dot ribbon is from Michaels, as is the Hearts embossed red cardstock paper. Posted by Diane aka cameldiva at 8:59 p.m.
April 30, 2007 at 1:52 a.m.
May 16, 2007 at 11:47 a.m.